I'm glad I read Betsy Bird's review of Rules of Summer immediately after I read the book. I went back and did another read through and I never would have garnered that meaning on my own had it not been for Betsy's insights. I feel like I need an interpreter every time I read a Shaun Tan book, or at least someone who is more adept at reading symbolism than I am. His books completely perplex me, but I also have an intense desire to talk about them with someone to try to figure out all the weirdness. 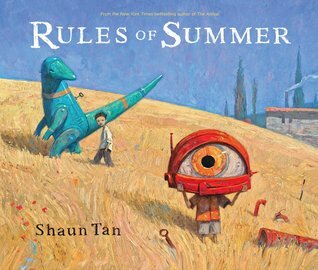 I liken Shaun Tan to the illustrator version of Neil Gaiman. I know Gaimnan's work is brilliant, but it's a little too creepy and weird for me and I just don't get the appeal. That is my exact feeling about Tan's work as an illustrator. I know it's brilliant, but it just doesn't resonate with me the way I feel it should. Rules of Summer might be a good book to read with students on the first day/week of school to give them something deeper to reflect on than the traditional "What I did on my summer vacation" assignment. Since the first line of the story is "This is what I learned last summer," that line coupled with the book's strangeness could be a catalyst for students to go beyond the typical "I went to Disney World and it was fun" response, and turn it into something much more detailed and thought-provoking.